Next Sunday 7th September sees the final round of the 2014 Welsh MTB XC series at Coed y Brenin. Racing kicks off at 9.30am with U12 categories, with Juvenile, Youth and adult races following at 11am and 1.30pm. There are also fun categories for adult novices wanting to give it a go. No race licence necessary, enter online or on the day. Well that was a long day, thank goodness the weather held off till the end. Thanks to all the helpers especially those who believed they were helping in the field and got sent up into the mist when promised help dropped out the night before. Strange about all those who turned up to compete after the race had started thinking it was a 1pm start despite having a ‘note new start time of 11am’ in red on the entry form they had sent in? Comments received that it was a cracking course even by those who had nearly collapsed on the finish line. Well done Jackie, 1st Welsh and Eryri British champion for 2 decades and backed up by Andrea and Helen T led the ladies to a silver team medal, now for 2015 girls. Congratulations to John Spill and Bronwen Jenkinson, who won the Welsh trial race in Betws for next month’s British & Irish Junior Mountain Championships for under 19 year olds. Along with Cai Linton-Davies and Mollie Davies of Menai T&F, they’ll be competing for Wales in Glendalough in Ireland on Saturday, September 20th. Wet conditions ensured that Mike Blake’s 1990 record of 8 minutes was not challenged at the Tryfan Downhill Dash today. The winner in 15.07 was Colwyn Bay’s Mathew Bicknall, his first race victory ahead of first V40 Eryri’s Craig Jones 15.11. Visitor to the area from Penzance Jonah Seaston took 1st junior in 25.43, and Elsie Salisbury 1st female in 30’18. A short service was held after the race in memory of sports photographer Pete Douglas who died 3 days after photographing the race last year. Some changes to the Caernarfon 10k, we now have chip-timing for the event and on the day entries will be limited. Also there is the Open British & Irish Junior Welsh Trial Race this Saturday 16th August 2014 at Betws-y-Coed starting at 11am. Entries are free. Registration at the Vagabond Hostel LL24 0AW. (No Parking). Here the club mountain championship table after Elidir Fawr. 1. Steven Walker, Chester 55.45 (1st Vet); 2. 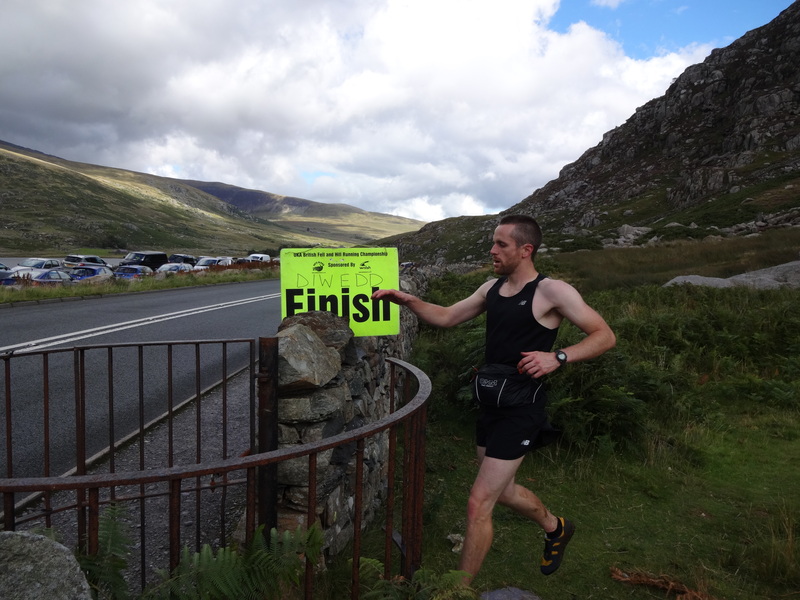 Dyfed Thomas, Eryri 55.56 ; 3. Owen Roberts, Porthmadog 57.14; 4. Noel Craine, Eryri 57.47 (2nd Vet); 5. Rhys ap Elwyn, Eryri 58.39 (3d Vet); 6. Gwilym Batchelder, Morfa Nefyn 59.00 , followed by Mike Fawcett, Hereford and Iwan Edgar, Eryri, both Vets. The 1st Female, 28th overall in 74.22, was Rhian David, USA, followed by Carol Morrison, Wirral (30th) and Claire David, USA (36th).